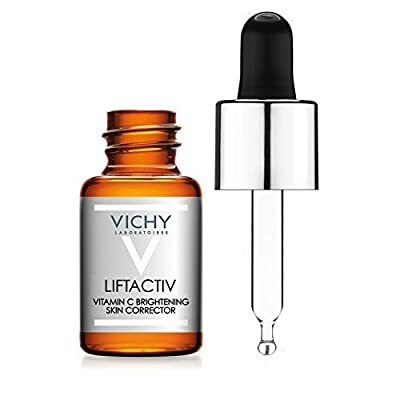 Vichy LiftActiv 15% Pure Vitamin C Serum Brightening Skin Corrector with Hyaluronic Acid & Vitamin E, 0.33 Fl. Oz. Product prices and availability are accurate as of 2019-04-26 05:54:55 EDT and are subject to change. Any price and availability information displayed on http://www.amazon.com/ at the time of purchase will apply to the purchase of this product. Amazon is an authorized retailer of Vichy products. The Most Recommended Anti-Aging Regimen by U.S. Dermatologists: Apply Vitamin C in the morning and Retinol at night with daily sunscreen use. Based on a survey distributed to U.S. dermatologists who are readers of Practical Dermatology 2018. Natural Origin Hyaluronic Acid, capable of holding over 1,000 times its weight in water to help hydrate and plump skin. Hyaluronic Acid helps improve penetration in the skin and helps your skin retain moisture. Pure Vitamin E from alpha-tocopherol, the most active form of Vitamin E, is an antioxidant. Vichy’s Mineralizing Thermal Water a miracle of nature from the preserved region of Auvergne, rich in 15 minerals, helps strengthen the skin’s moisture barrier function to help protect skin against daily aggressors. Together the pure and potent formula works to brighten and firm the appearance of skin in just 10 days. 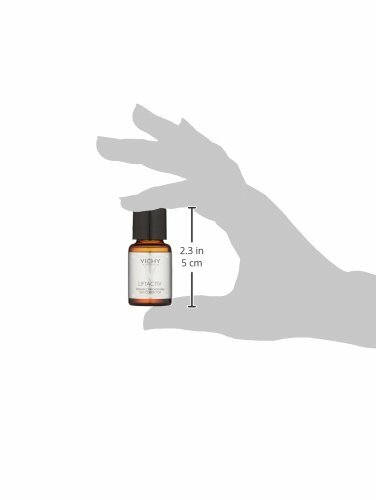 This face serum absorbs quickly into skin's surface. Regimen/How to Use: In the morning, use serum dropper to place 4 to 5 Vitamin C serum drops in the palm of your cleansed hand. Then use fingertips to apply to a clean, dry face avoiding the eye area. Wash hands after use. Use once daily. Let the Vitamin C serum sit for a few moments, then apply your daily moisturizer. Follow up with a sun protection of at least SPF 15 before sun exposure. At night, use with Vichy LiftActiv Retinol Concentrate. Only 11 ingredients: Aqua / Water, Ascorbic Acid, Vitamin C, Alcohol Denat., Dipropylene Glycol, Glycerin, Laureth-23, Neohesperidin Dihydrochalcone, Sodium Hydroxide, Tocopherol, Hydrolyzed Hyaluronic Acid, Pinus Pinaster Bark/Bud Extract. Formula evolution: With 15% Pure Vitamin C, this Vitamin C serum formula color may change over time but this has no affect on product efficacy. Formula is stored in dark colored glass packaging to slow down oxidation and other degradation accelerated by light. Glass is the most stable way to store Vitamin C formulas, as acids can react with plastic packaging. For maximum product potency, store in a cool, dry place and keep away from heat and light. Caution: Flammable until dry. Keep away from flames and heat. Expiration once opened: 1 month. Product packaging may vary. True anti-fatigue effect. Concentrated on vitamin C and hyaluronic acid. Indicated in times of great wear.